Are you tired of feeling overwhelmed by all there is to do, frazzled by being permanently on the go and stressed by your never-ending to-do list? 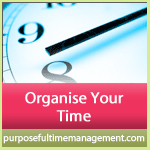 The Organise your time e-course is a step-by-step system to take you from chaos to order in just 12 weeks. I did my first day today of trying to keep track of my time. I used the daily log sheet and I am already in shock at how much time I waste in the morning on the internet and watching tv (news, etc.) Then I had some banking to do, and stopped at the dollar store , and then went and bought paint. More time wasted while shopping at the dollar store, I didn’t need a thing in there.Actually keeping the log is the biggest first step in managing time, I can see. Now I know where my time is going and it is only Day one. This is crunch time – you’re already feeling overwhelmed and unfocussed, and I don’t want to add to that feeling of being out of control by sending you tons of stuff all at once. You don’t have time to read ebooks or listen to hours and hours of audio. You need short and punchy! An e-course is manageable because it’s delivered in bite-sized chunks. After you read each lesson, you have time to implement it every week which means GREAT results. You get support and accountability. Overwhelmed, distracted, busy people who feel rushed, frazzled, stressed most of the time. I have been taking Marcia’s Time Management Course for a few weeks now and find that it has been very helpful in improving my time management. One of the most helpful aspects of the course was keeping a log of where I was spending my time. This was really an eye opener for me, and I found that I have been much more aware and focused in this area. That one aspect alone has increased my productivity. Marcia’s style is direct, clear and concise and to the point – exactly what you require in a time management course. I look forward to receiving my email every week. I loved the clarity of your teaching – you give me the confidence to do more. Once you register and pay, I’ll hook you up and you’ll get your welcome pack and week 1’s lesson within 24 hours. You’ll also get the download links to ALL the fabulous bonuses. You’ll receive subsequent lessons on the same day every single week. Of course! There’s no rush – you have a whole year to try out the system and if you genuinely feel it hasn’t been worth the money you paid, all you do is write to me and ask for your money back. Now that that’s out of the way, let’s recap. What do you get? © 2010 Marcia Francois. All Rights Reserved. Design by Tracey French Designs, built on a Thesis foundation.